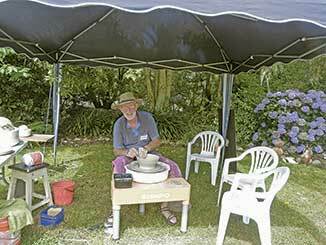 Otaki lived up to its sunny reputation and delivered blue skies and warm temperatures for the opening days of Otaki Potters Club recent fundraising event, the Festival of Pots and Garden Art. 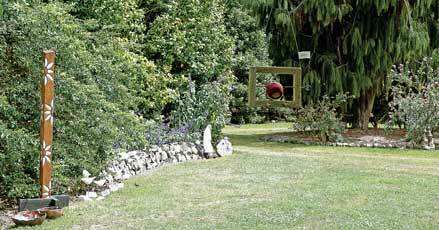 Held within the sheltered 10 acres of Anam Cara (formerly Coehaven), the established English-style garden was a perfect foil for the array of local and national artwork (the blue of hydrangeas and agapanthus, the dark green of surrounding conifers, and the cooling ice-white of the standard roses providing an excellent backdrop). Although originally held at Trinity Farm (the annual event was launched nine years ago), Anam Cara was chosen a second time as a venue, and Club vice-president, Brent Craig said the owners had been extremely supportive. The 60 exhibitors included artists from Napier and Wanganui, though “all potters throughout New Zealand are welcome,” and with more than 2,800 items on display and for sale, there was literally something for everyone. Prices ranged from just a few dollars per piece, such as a pottery herb label, to several thousand for larger pieces.The addition of ‘new faces” contributed to the fresh look of the exhibition, and Club president, Rod Graham said more than 1,000 people, “it’s a great family day out,” had visited in the first two days. Highlight of the nine day festival was a selection of weekend demonstrations. 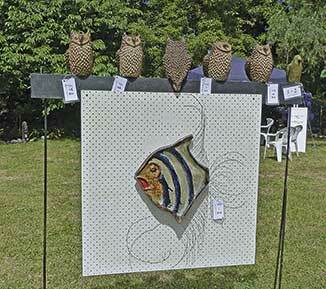 These drew interested crowds, providing an opportunity for potters and artists to display their skills. 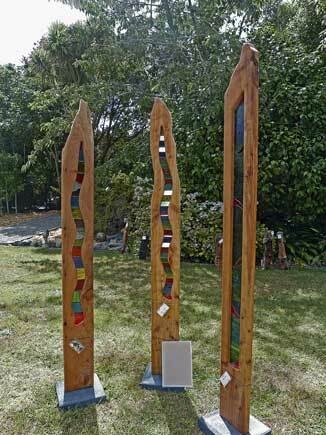 It also gave visitors a chance to learn something about the various art forms.The range of artwork on display included material by The Carver, who creates large totem-style pieces from native New Zealand woods such as ponga, charming ceramic birds (in flight) created by Linda Mikkelsen and the picturesque pottery houses and villages handcrafted by Colleen De Verre. Many works were also displayed in Anam Cara’s conference area, and Club member, Jude Whitaker explained The Retrospective Collection contained pots made by members over the last 25 years, including material by foundation and lifetime member, Beryl Rowe.